These are of course a fun twist on a common treat which is one of my favorite things to do! Make one treat into another with the same flavors. For example, carrot cake blondies, apple pie stuffed spice cookies, or margarita doughnuts are all other treats originally and I borrowed their flavors! It's so much fun to create new recipes. 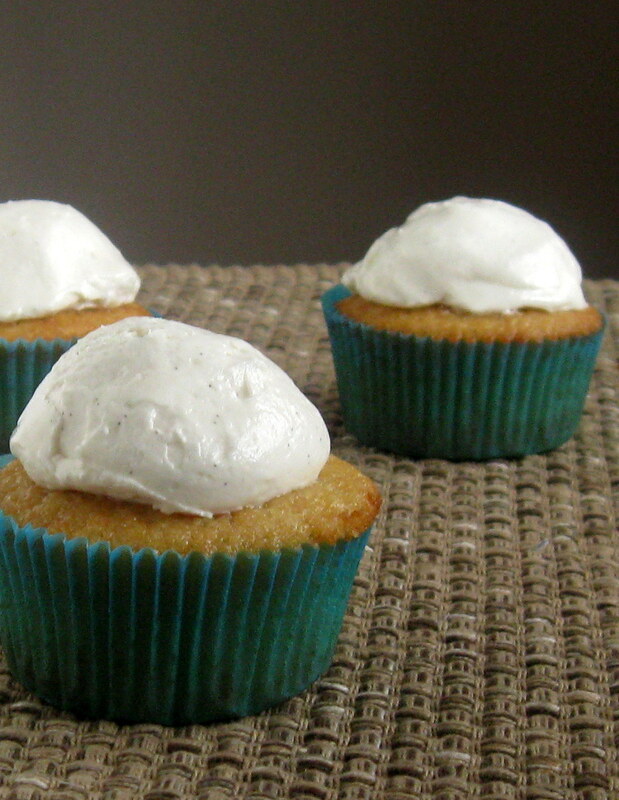 These are a quick and easy recipe and they're fun for kids, mostly because kids love cupcakes, pretty much any cupcake. :) If you can find it then some root beer flavoring might add a bigger burst of flavor which would go nicely with the vanilla bean frosting. The root beer flavor right now is a light flavor which is complemented by the frosting. This recipe only makes 6 cupcakes so it's perfect for a small group of people or if you want to have several desserts and not to many of each. Happy Baking! 1. Preheat oven to 350F. Line a 12-cup muffin pan with cupcake liners, set aside. 2. Using a mixer blend together the butter and sugar on medium speed for 2 minutes. The mixture will be light and fluffy. Scrape the sides and bottom of bowl. 3. Add in the eggs, one at a time, mixing after each until blended. Scrape the sides and bottom of bowl. 4. Add the flour and baking powder and mix until well blended. Add the root beer and mix at low-medium until well blended and smooth, about 30 seconds. 5. Evenly divide the batter between the 12-cup muffin pan filling each cup about 2/3 full. 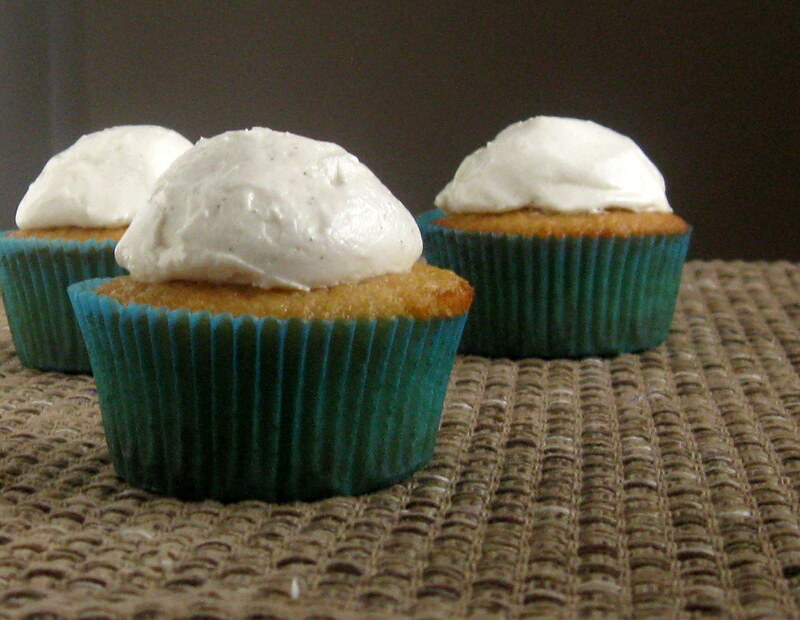 Bake the cupcakes for 23-25 minutes or until a toothpick inserted the cake comes out clean. Remove the cupcakes from oven and let cool on a wire rack. 6. While the cupcakes are cooling prepare the frosting. In a large mixer bowl blend 3/4 cup butter with 1 cup powdered sugar on low speed until it starts to come together, about 30 seconds. Add in the rest of the powdered sugar one cup at a time, mixing until mostly blended. After all of the powdered sugar has been added then add in the milk until the frosting reaches the desired consistency. Mix in the vanilla bean paste. 7. Pipe or spread the frosting on the cupcakes. Serve. I can just imagine how yummy these would be straight from the fridge!!! And what a great idea to use vanilla bean paste so there are flecks in the cupcakes!!! yum!! !